This was my first "voyage" aboard the Queen Mary and I was quite impressed with her majesty. Originally she set sail on the high seas in 1936 and was later retired in 1967. Many of the original features of the ship and cabins are still intact complete with original wood veneers and art deco glory. Here I am on deck, donning my J. Crew Gardenshade Floral dress and suede Mona pumps. The decks were very slippery and seeing as though I had not broken my shoes in, I was sure that I would be in for a fall. Luckily I had my husband to hold on to so that I wouldn't fly overboard into the sea. This is pretty much the same picture of me, but it shows some of the wood veneer that lines most of this ship. It might not look like much, but it is quite impressive to see in person. I don't think you'll find this on Carnival Cruises. After the dinner, guests were invited to go atop the observation deck of the ship for cigars and more Scotch. I had forgotten this part of the evening and didn't bring a coat or sweater (which I am known to carry at all times, even in 100 degree weather), therefore my husband lent me his heavy wool blazer (one of his few J. Crew purchases) for warmth. It looked rather ridiculous but first, it was warm and second, it matched the fact that I was clad in head to toe J. Crew. Below you will see a view from the deck and me with a cigar and glass, which at one point had Scotch in it. For a nightcap, we went to the Observation Bar which still maintains its original Art Deco charm. The bar looks pretty much the way it did when the ship was first built. I especially loved the mural adorning the top of the bar. 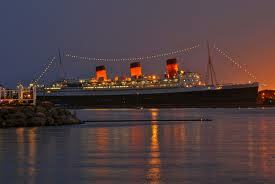 This isn't my own photo, but here's a picture of what the Queen Mary looks like lit up at night. Due to its immense size, it's a bit overwhelming to photograph the entire ship in its entirety unless you travel quite some distance away from it, which I wasn't too much in the mood for after eating a lot of food and having a few drinks. Katie, your adventures are always SO cool! DH and I are looking to come down to LA one of these weekends and this is so up his alley. You look great in the J Crew dress, too! Thanks! I highly recommend the Queen Mary. It is an interesting part of history that you won't be able to experience anywhere else.